Mexico slapped the United States with $2.4 billion worth of tariffs on 90 unnamed industrial and agricultural products. The move comes in retaliation after the U.S. Congress cancelled a pilot program that would allow a handful of Mexican truckers to deliver goods throughout the U.S. According to Gerardo Ruiz Mateos, Mexico’s Economy Minister, the tariffs are allowed under the 1994 North American Free Trade Agreement (NAFTA). “We consider this action by the United States to be wrong, protectionist and clearly in violation of the treaty,” Ruiz Mateos added. Mexico’s actions might be coming at one of the worst times in the U.S.’ economic history. In January, exports from the U.S. to the world fell 12.5% from the month prior. Since August the figure has plummeted 33.45%. To Mexico alone, that figure has fallen to levels last seen in Jul. 2005 or by 34% since August. U.S.’ southern neighbor might be hurting itself too. Mexico’s Peso has tanked after hitting a 6-year high against the U.S. Dollar of 9.85 on Aug. 04th. It reached an all-time low only three days ago of 15.58. Such a violent change in price will make it more expensive for Mexicans to purchase goods produced north of its border. But with the enactment of such tariffs, the inflationary pressure felt from Peso weakness will only be exacerbated. Thus the new trade policy may actually prove to hurt Mexico as much as it does the United States. In a speech given yesterday, Guillermo Ortiz, Governor of the Bank of Mexico (BANXICO), promised that he would defend the Peso for the “foreseeable future.” The expectation-anchoring announcement came after the Mexican currency tumbled 30% against the U.S. Dollar – over the previous six months. Indeed, the currency has become Latin America’s worst-performing one over the said period. 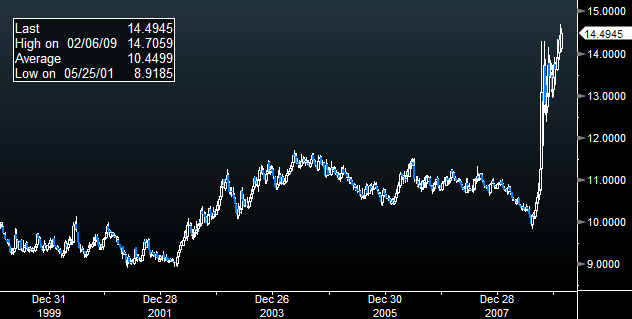 At the Peso’s low, Feb. 4th, the greenback could purchase 14.70 units of the Mexican currency…a stark contrast from it’s 6-year high, Aug. 04th, 2008, of 9.85 units. “A little late in the game” seems to be the theme surrounding BANXICO’s delayed reaction to the U.S.’ credit crisis. While most of the G7 central banks slashed rates, Ortiz raised them – from 7.50 to 8.25% over a three month period between May and August of 2008. It was not until January’s meeting that the monetary authorities nipped the rate by 50bp – a small move compared to the three digit point slices being slashed off the overnight rate in many countries like New Zealand and the UK.